BT4.1 + EDR ensures transmitting strong signal in high quality and high speed. It is widely compatible with 95% BT-enabled devices including smart phone, tablet, laptop and other BT devices. Play music from your car AUX audio system and home audio and broadcast car navigation information. With multipoint connection, you can connect two devices to the adapter and use them separately. You can make hands-free call during driving through high-sensitivity mic. Also, built-in 200mAh rechargeable battery ensures several hours of working time. Plus, it supports reading maximum 32GB TF card. Believe it will be a great companion for your life. * Widely compatible with 95% BT-enabled devices including smart phone, tablet, laptop and other BT devices. With multipoint connection, you can connect two devices to the adapter and use them separately. * Wireless 4.1+EDR technology ensures transmitting strong signal in high quality and high speed. BT range reaches up to 10 meters in open space without obstacles. * With high-sensitivity microphone and call voice broadcast function, it enables you to make hands-free call and help you driving safe. * When you connect this adapter through BT to car audio system, it has GPS navigation prompts function, broadcast the navigation sound through car audio system via BT connection. 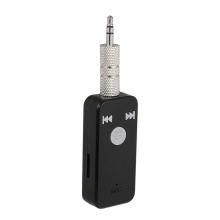 * Built in 200mAh rechargeable battery, it ensures several hours working time and low consumption. * Simple keys design helps you operate this receiver easily. Support reading maximum 32GB TF card, you can play audio files from it, provide you with more choice. Note: It supports reading TF card up to 32GB.